According to Kirk Sorensen, the energetic and charismatic engineer who was the first to gather an internet based community of molten salt reactor enthusiasts, the original idea to build a molten salt reactor sprouted in the visionary and Nobel Prize winning mind of Eugene Wigner, in 1947. In the 50s, 60s and 70s, several successful prototypes have been build and operated. The most famous of these programs was the Molten Salt Reactor Experiment in Oak Ridge National Laboratory in the 1960’s – the reactor went critical in 1965 (meaning: it started running) and it ran successfully until 1969. The MSRE has a very informative page on Wikipedia. Unfortunately, the Nixon administration had a political agenda that left no room for an alternate route to cheap and clean energy – one that did not deliver plutonium for weapons production and that was based on research in a small and politically unfashionable town. After the molten salt reactor had been shut down in 1969, the research in Oak Ridge continued into the early 1980s, until the government finally ended the funding – to the dismay and disbelief of the scientists involved. Around 2000, several young engineers rediscovered the molten salt knowledge that had been build up for over 40 years. Two early birds that stand out in this movement are the American Kirk Sorensen and the Canadian David LeBlanc. Sorensen stumbled on the concept while investigating possible energy supplies for a future moon base, he was working for NASA at the time. LeBlanc stumbled on the concept while he was a PhD student studying fusion physics. He realized that while fusion is bound to remain a promise for decades, molten salt technology could deliver all the energy for the world demand, starting in less than a single decade. Both Sorensen and LeBlanc have programs going now. David LeBlanc takes a more pragmatic approach. His vision is to build a molten salt reactor that is as simple and safe as possible: the Integral Molten Salt Reactor (IMSR). LeBlanc avoids any road that might take extra time to travel. For the time being, this excludes attractive options like building a fast reactor (meaning it uses ‘fast’ rather than ‘thermal’ neutrons) or to go straight for building a ‘breeder’ (a reactor that creates its own fuel).Attractive though a ‘fast breeder’ may be, LeBlanc wants a reactor that is more doable at the present time. The first model LeBlanc and his team are planning to build gets ‘only’ six times as much energy out of a gram of ‘burnable’ metal than does a conventional reactor. However, once his first reactors are ready for the market, ‘early next decade’ according to the company website, LeBlanc already plans to build more advanced versions of his simple reactor including in situ recycling of fuel, allowing him to also use all of the energy content in the metal – meaning it will also be hundred times more efficient than today’s nuclear reactors. In the menu’s above this page direct you to several MSR’s that are getting ready for the contest. However, there are many more MSR projects going on in the world. Since 2010, the worldwide revival of the molten salt technology is expressed in a growing number of initiatives. To the informed observer, this is not surprising at all. Just like the chemical reaction we call ‘burning’, nuclear ‘burning’ is a natural process and it can occur in many, many ways. So it’s only logical that eager researchers and entrepreneurs are after a slice of the future energy pie. Over the past five years, on the world map we see initiatives popping up. In the last months of 2014 and early 2015, the resurgence of molten salt reactors leads to a stream of developments that have become so numerous that they are increasingly difficult to oversee. 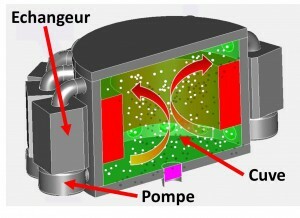 The picture above is a concept drawing of the Molten Salt Fast Reactor, that is being developed by Elsa Merle-Lucotte and her team in Grenoble, France. In Canada Terrestrial Energy. Initiator: David LeBlanc. Reactor: Integral Molten Salt Reactor IMSR. Some quite amazing things are happening around TE. In the second half of 2014 en early 2015, TE has anounced initial collaboration with Oak Ridge National Laboratory and a strategic collaboration with the University of Tenessee. Apparently, many of the retired Oak Ridge molten salt researchers have found a new home with TE. United States: Flibe Energy. Initiator: Kirk Sorensen. Reactor: Liquid Fluoride Thorium Reactor (LFTR) Quoting their website: ‘Flibe Energy is developing liquid-fluoride thorium reactor (LFTR) technology to access the energies of the element thorium…’. The company has not been sharing too many updates recently. United States: Thorcon Power. Initiator: Jack Devanney. Thorcon Power is the new kid on the block of the molten salt reactor movement. And made an entrance with a hugely ambitious business plan. Quoting Charles Barton: “Their goal appears to be nothing less than the electrification of the planet with molten salt technology by 2050 or so…” Backed by deep pockets, this is a claim not to be overlooked. United States: Transatomic Power. Initiators: previous MIT PhD Students Leslie Dewan and Mark Massie. Reactor: TAP (previously known as the Waste Anihilating Molten Salt Reactor: WAMSR). Although they dropped the name, the orginal idea of this MSR had a nice marketing edge to it. In a technical paper, published in 2014, they sketch an interesting picture of their concept. And come with an innovative moderator of zirconium hydryde, that avoids some unpleasant properties of the ‘traditional’ graphite moderator. This Bill Gates-backed company is famous for its research on the Traveling Wave Reactor, an innovative solid fuel design with some strikingly good properties, but allas not a molten salt reactor. Since 2013, there are incessant rumors that Terrapower is switching its focus to molten salt reactors. United Kingdom: Moltex. Initiators: Dr Ian Scott and John Durham. In august 2015, Simple Molten Salt Reactor (SSR) drew international attention as Moltex’s reactor was identified by a UK survey to be the most suitable configuration for immediate pilot scale development in the UK. Reactor: Molten Salt Fast Reactor (MSFR). Althought this reactor does not (yet?) 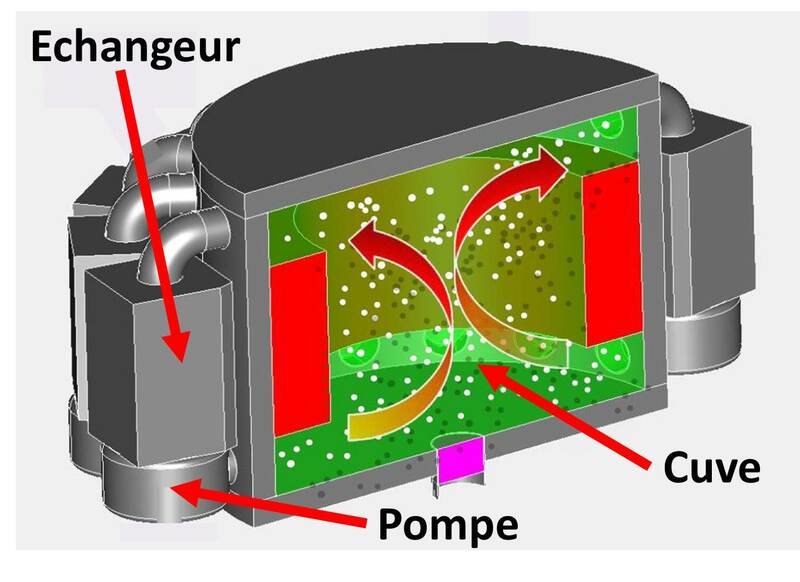 have its own website, the basic concept is very interesting: it’s a fast reactor (the French seem to be less hesitant in this respect) and the core design is optimized for natural convection of the fuel fluid. Germany/Canada: Dual Fluid Reactor (DFR). Initiators Armin Huke, Götz Ruprecht, Daniel Weißbach, Stephan Gottlieb, Ahmed Hussein and Konrad Czerski. The DFR is a strikingly elegant concept, a lead-cooled fast reactor with a molten salt core of pure fuel salt. Nevertheless, claim the authors, the DFR is based on techniques already in use. Japan: Fuji Reactor. Initiator Dr Moto-yasu Kinoshita. Reactor: MSR-Fuji. Tokyo-based Thorium Tech Solution (TTS) has a plan to burn Japan’s unwanted nuclear heritage in a molten salt reactor. Hopefully, his initiative will not only transmute actinides, but ultimately also Japan’s nuclear industry, and give the country a clean escape from its energy shortage.